Twice a year, The Gaol Events – a CQB site in the heart of Oakham in Rutland - runs an Airsoft boot fair that attracts big retailers/brands and Airsoft booters and enables them to showcase/sell new products and sell second hand goods as well as get in a taster game of the site and a chance to run a 3 gun course. In April we reported on one of the fastest growing Airsoft events held in the Midlands, and we returned this October to the Gaol once more to find the Midlands Airsoft fair bigger, better and more popular than ever. Prison Ashwell in Oakham, Rutland. Majority of the Prison was redeveloped as part of the Oakham Enterprise Park in 2013 but 3 of the former wings remain with cells intact for players to fight though along with large outdoor spaces including an exercise yard that still has all the old features of the Prison, from the barbed wire to high prison mesh walls. The site itself is impressive and having played at the Gaol on a fair few occasions, I can say that if you like really close quarter combat, the Gaol is definitely a site you should try. My favourite areas of the site are G Wing – a long wooden building that holds a maze made from the old cells – it is pitch black, super close quarters and absolutely terrifying. This part of the site is one of the toughest areas to clear in the attack and defend game modes! I am also really partial to E Wing as well, a huge brick building that houses cells, common rooms, stairwells and low light corridors to battle your way through. The cost of the event is as per previous events was a humble £5 which includes entry to the fair, a sausage or bacon cob, a chance to run the 3 gun course and a taster game within a section of the gaming area. This event we saw a massive increase on the last event in both booters and retailers including new and well known names: Ammo Drop – retailers of Airsoft guns and accessories, BB’s Direct – BBs in bulk, RS Airsoft Supplies – retailers of internal parts, 3D printed parts and consumables, ASPUK – distributor of Sniper Airsoft Sniper Rifle upgrade and replacement parts, MTPCAAS – retailers of MTP clothing and accessories, Staffordshire Militaria Supplies – Airsoft, Army Surplus and Outdoor Clothing Supplies, West Midlands Airsoft – Airsoft site based in Stoke on Trent, Nuprol – Suppliers of gas, tactical kit and batteries, ASG – Worldwide manufacturer of realistic imitation firearms and BBs, iWholesales – Importers and Wholesalers of Airsoft Guns and Accessories, Enola Gaye – World leader in pyrotechnics for Airsoft and Paintball, SWAS Airsoft – Retailers of Airsoft Guns and Accessories, Dave’s Custom Airsoft – Retailers of Airsoft Guns and Accessories, The Draft Club – Manufacturers and Suppliers of BBs, Valken – Suppliers of supplies for Airsoft an Paintball. With a varied and extensive list of sellers and booters there was something for everyone. In my previous report I had said that the fair was more for people who were beginners rather than those of us with all the kit but I’m pleased to say that the fair has definitely upped its game from the last event! I would still love to see more big brand names attend the fair but as the fair grows I’m sure this will happen in the near future. During the fair the punters get to see new and prototype products from the retailers, this event we got to see a whole host of new products from Nuprol such as their new CE rated shooting glasses and mini 2.0 green gas bottle which is sure to prove popular with Airsofters as this new bottle is smaller, lighter and can be carried more easily on the field! We even got to see the new black smoke from Enola Gaye which is due to be released in December and the new 3 minute Cloud Maker Smoke Grenade which we should see in all 9 colours of smoke released in early 2017! At every fair, a raffle is held in aid of the events chosen Charity ‘The Pilgrim Bandits’ and this event was no exception! The Pilgrim Bandits are an amazing charity who help our injured service men and women ‘believe in a life worth living again’ by pushing them to new limits with sponsored sky dives, kayaking and other sponsored events that help raise money to support more injured troops and research to push scientific and engineering advances into prosthetic limbs. Our friends at the Pilgrim Bandits are also Airsoft Action’s chosen charity. It is always a pleasure to catch up with Terry and Mike Arnett, the father son team who head up a lot of the midlands fundraising for the charity. This event we saw some amazing raffle prizes including £150, £100 and £50 vouchers to spend at either Ammo Drop, ASPUK or BBs Direct, a BB bundle from Valken, and a range of Gas and PMC caps from the team at Nuprol amongst other prizes which raised a great amount for the charity! I think it’s amazing the support the Airsoft Community shows for great causes such as the Pilgrim Bandits. As well as walking around the fair, purchasing and checking out the new products from retailers, Airsofters get the chance to run the 3 gun course (using a pistol, shotgun and rifle) – an accuracy challenge that is run in the F Wing area of the prison, during the course competitors must eliminate targets with all three weapons in the quickest time and take part in one of 3 mini games that are held throughout the day each limited to 30 players per game, and in these games both walk on and rental players are welcome, with all the kit being provided for rental players! It is worth noting that rental players are allowed to play more than one game to really get a feel for Airsoft! I think it’s great that this is offered as it gives potential new players the chance to try out Airsoft without paying £45 plus to play a rental game day! The gaming is held in the G Wing area of the prison. All in all, I really enjoyed the Midlands Airsoft Fair and I definitely feel the event is proving itself event after event to be a great day out and as always excellent value for money, especially as the price includes a breakfast cob and a mini taster game! 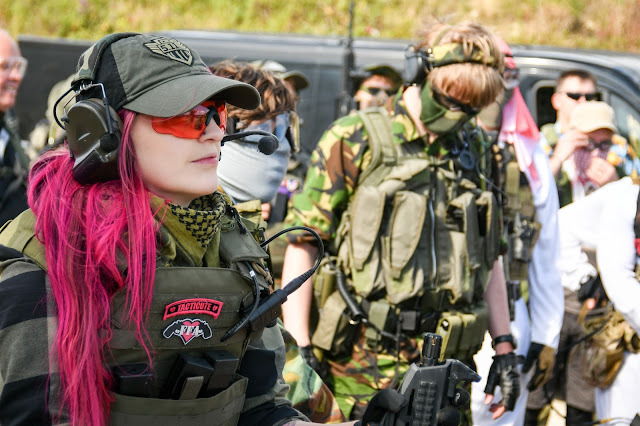 The £5 entry fee is extremely affordable and won’t break the bank and it gives potential new players a chance to experience Airsoft for such a small fee compared to average rental day fees so this gets a huge thumbs up from me. The selection of retailers and booters this event was varied and extensive so there was something for everyone on the day, from pyro to RIFs to tactical clothing, everything was covered. It is also a great social event to meet like-minded Airsofters, for me this was the perfect chance to meet new friends and catch up with old friends. I am excited to see what the Midlands Airsoft fair has to offer the Airsoft Community at its next event in April 2017! Hardwick, K. (2016). Midlands Airsoft Fair. Airsoft Action. Xmas (69), 54-55.